Huddersfield Amateur, Shelf United and Shelf FC registered impressive away wins to earn places in the semi-finals of the Halifax FA Saturday Cup. The fourth quarter-final, between AFC Crossleys and Ealandians at Holmfield Rec, was postponed. The most eagerly awaited tie was arguably at Walton Street where Amateurs, who have a good record in the competition, overcame a potential banana skin when beating Sowerby Bridge by 3-0. As expected Bridge put in a feisty performance but were eventually outclassed by the West Yorkshire League Premier side with goals coming from Slater Barnes and Jordan Byrne in the first half and a wonderful Matty Jones volley which wrapped things up. Bridge’s Adam Barlow and Tom Hiley had good efforts saved by Lee McGrath in the first half but the Amateurs squandered a number of good chances and some fine last ditch defending by the home side kept the score respectable. The match was well handled by referee Robert Gatenby. Shelf United were 2-0 winners away to Ryburn United, who now play in the West Riding CA League after looking possible champions of the Halifax AFL for much of the last campaign. 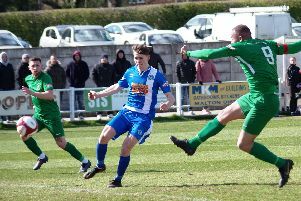 Visiting boss John Lister thought his side had played the better passing football while Ryburn had employed a more direct approach. Shelf started well and Billy Grogan went through one-on-one with Lewis Scott, who made a fine save. The visitors to Ripponden Wood took the lead midway through the first half when Luke O’Brien stretched to prod the ball home from six yards after good build-up play down Shelf’s left. Ryburn went closest in the first half when a Brad Tynan effort was helped onto the bar by keeper Ethan Daly. Play was even after the break. Dave Chappell was denied by a good save from Scott and Shelf had other chances while Ryburn were unhappy about having a goal chalked off for offside. The clincher came with a couple of minutes left when O’Brien cut the ball back to close to the penalty spot, where Ben Grech placed the ball into the bottom corner. AFL champions Shelf FC powered into the last four with a 6-0 win over Division Three leaders Elland United at Carr Green, Brighouse. Callum Lewis scored twice and there were others for Alex O’Keefe, Will Parkin and Ewan Gardiner plus an own goal.